Ethyn Regret, an actor who is currently trying to deal with a scandal concerning him and his rock star roommate. He is also getting ready to go on location to film his new movie. Tahlvin Shadowtalon, an elf who works for the Wraith Warriors, a company that provides mercenaries and operatives to other businesses or governments for a fee. He seems quite amused by the drama that seems to have recently gripped the household. 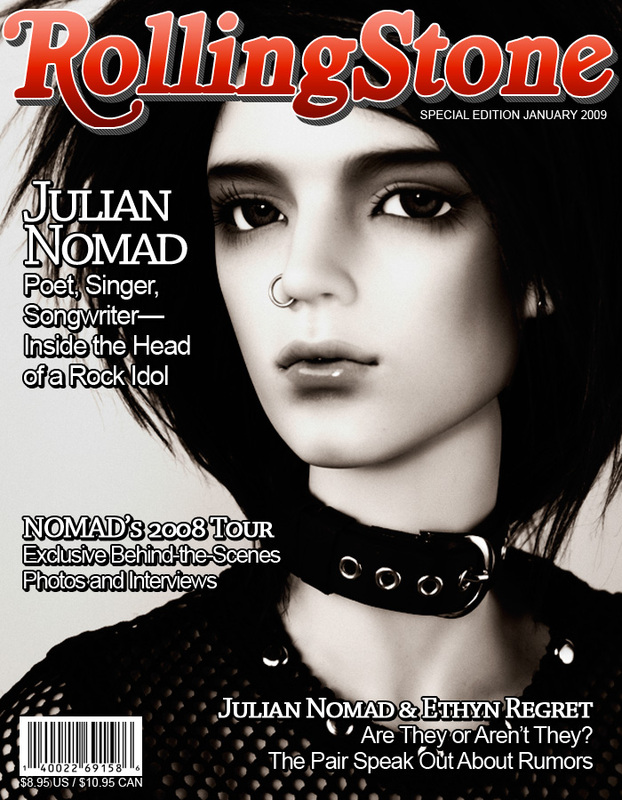 Julian Nomad is the lead singer and songwriter for the industrial rock band NOMAD. As the other person caught up in the scandal, he's been trying to figure out how to talk to Ethyn about it all. Amazing! I can see how you spent quite a bit of time on this. And we finally get to see Tahlvin's gorgeous tattoos! Priceless :D. I've only done one photostory with my first doll and since gave up on it so I can appreciate the effort you put in. This one is very well structured, not to mention there's a healthy dosage of eyecandy. I'm not really familiar with the other two but Tahlvin's personality really came out nicely in the pics :XO:. BanSidhe: Thank you! Yes, Tahlvin wanted to do the pictures with his jacket off so that he could show off his tatts. HydraKitten: heehee Yeah, Tahlvin has such a confidence and arrogance that he just dominates the scenes. I love his character. And, thank you! I'm really glad you enjoyed it! This was a wonderful read. I love the comic format and I swear Tahlvin is simply delicious. Gah! It's been such a long time… but I still wuv Ethyn. What makes a doll so good-looking and charming? (Of course, you characterised him, so you take some credit for making him "be" like that). I really like Tahlvin, too – it's funny seeing him as a Sim, and then again as a BJD! I love his tattoos, and his little smirky mouth. Poor Ethyn and Julian; there has to be more to this than first meets the eye. E. Black: Thank you! I've always wanted to try a comic format. I'm a huge manga and comic fan. And, yes, Tahlvin just slays me no matter what form he is in. amalinaball: Ethyn is a sweetie who is hot as well. I love the guy. As my first doll (that arrived) he is the center of my BJD family. You have no idea how perfect this is. You just brightened my day! Anyways, the photos are great as usual (I love your doll-sized set) and the layout is just like reading a manga. Excellent job! *sigh* Your boys are so beautiful. All of them. I can't pick one. Kiwi: Hi there! I'm very glad you enjoyed my story and that it helped make you day better. That's such a wonderful compliment to me. I've read so many comic and manga over the years that doing the speech bubbles was almost second nature to me. They were fun to draw and layout too. Oh WOW. Brilliant! And it's a photostory! Yay! Aoibhgreine: Thank you! It was super fun (thought hard) to do. "Hell, my birth was a scandal." Fufufufufufu~! I'm curious to know 'bout Tahlvin's backstory/birth, too. Bunnisteffi: Hopefully, I'll get a chance to tell about Tahlvin's backstory/birth sometime. It will either be in Worlds Apart or here. I will tell you though that he wasn't lying when he said his birth was a scandal. And, yes, poor Julian. I think he was almost glad that they weren't paying much attention to him at first. He's really nervous about talking to Ethyn so it was kind of a brief reprieve. Ethyn looks dreamy – I think I like blonds when it comes to my comic/bjd/movie heroes. Lani: Aw, thank you! That really means a lot coming from you. It's funny that Ethyn has become a blond. In the beginning, I really thought he'd be dark-haired guy, but the lighter colors–blond and even red–seem to work best with him. By the way, wait until you see the awesome new outfit I got for him. Think "Rococo". I'm SO late in commenting on this! Actually I've already read it on your flickr (I think…) and I commented there, but… I wanna comment here too! Ah!! This was such a great idea! You totally went out and gave a great 'fanservice' to those who… you know, are like me~ kekeke. I loved the entire idea of this! The angles were fantastic, but that was to be expected and the plotline, though short, was very captivating. I'm especially interested in Tahlvin now. haha Yep, you commented on Flickr as well, so thank you for taking the time to do so here as well. It's sad that Dom is gone, but I'm glad that you see the possibilities with my other guys. Thank you so much, Madeline, for your wonderful comment! It's a wonderful way to start the week. I hope you enjoy exploring the rest of the site.